Here, an adult comes forward, his hand on the shoulder of a child who is guiding him. There, flies stick to the eyes of a sleeping baby whose eyelids are covered with scabs. Two scenes frequently to be met with in tropical regions, at least during the first half of the 20th Century. Eye diseases are a real scourge in these countries where, in the fifties, the average rate of blindness is ten times higher than in Europe (7 for a thousand as against 7 for ten thousand inhabitants). Here again, it's just a question of averages, certain rural regions reaching 50 for a thousand inhabitants. Children are not spared : 16 % of the blind in Cameroon are children. The three principle causes of blindness in the tropics are trachoma, onchocercosis and cataract. Only the first two are specific to tropical zones. But other endemic diseases of the region can also afflict the eyes : leprosy, certain types of parasitosis, nutritional ailments, etc... What's more, eye troubles that are common-place in Europe become complicated to the point of ending in blindness. The causes are the lack of water, the absence of hygiene and deficiencies in treatment. This is so in the case of what is called epidemic conjunctivitis. In black Africa, in the 1960s, measles is responsible for one-third of blindness in children; maternal genital infections contaminate new-born babies; Vitamin A deficiency leads to dryness of the cornea and the weakening of nocturnal vision. 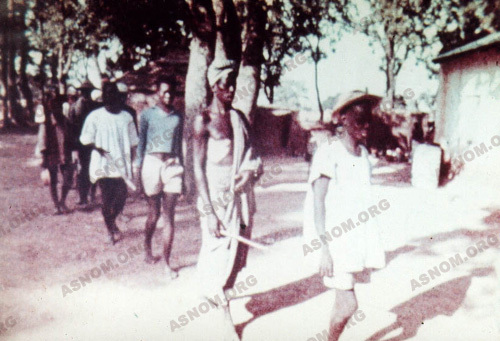 For a long time, as elsewhere in the world, medical intervention in the French colonies is limited to the application of antiseptic eye lotions and ophthalmic ointments. These are simple curative gestures proper to the versatility of the AMI staff. In the medical schools and organizations, the detection of eye troubles takes place earlier and problems of eyesight can be corrected with pairs of spectacles freely delivered. On the level of surgery, cataracts were operated on with success from 1890 onwards (Clarac*). 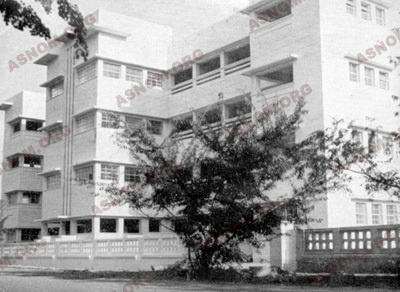 The first two institutes of colonial ophthalmology are created in Indochina : in Hanoi in 1913 and in Hue in 1920. The second is named Institut Albert Sarraut. 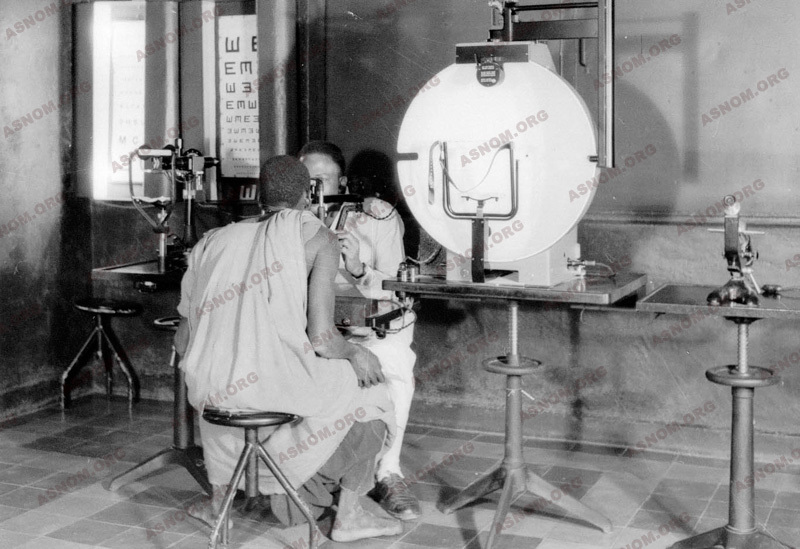 Originally intended particularly for the fight against Trachoma, these establishments treat all eye diseases. Patients can be hospitalized there and undergo necessary surgical operations. Little by little, the organization of mass campaigns leads to the detection and treatment of diseases that cause blindness. Unfortunately, it happens that the inappropriate use of medicines is itself the cause of blindness, as indeed are the arsenical overdoses in the treatment of sleeping sickness. mobile ophthalmologic groups set out towards the population and play such a great role in the fight against onchocercosis. Eye diseases which caused worry at the beginning of the 20th Century have decreased, but now there appears a cosmopolitan ocular pathology which is just as frequent as elsewhere : glaucoma, retinopathy, optic neuritis, various problems of eyesight, etc. - Védy J. Graveline J. : Précis d'ophtalmologie tropicale. Diffusion de librairie Edit. 2° édit. Marseille 1988.